The #IceBucketChallenge has turned into a social media snowball. It's gaining tremendous traction - more than $15 million in donations to date, according to Time, and 1.2 million videos on Facebook and counting. 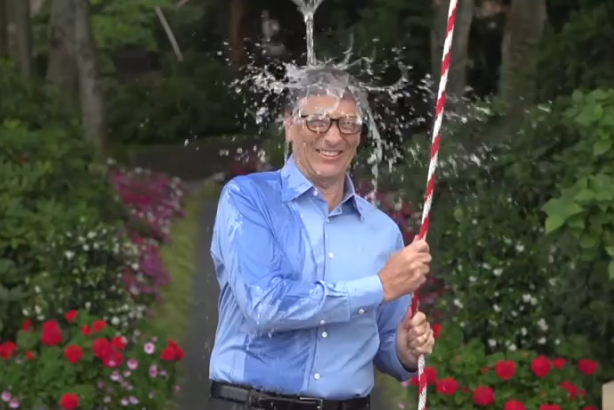 Bill Gates takes the ice bucket challenge. Much has been made of the simplicity of the #IceBucketChallenge. Within 24 hours of being nominated, you pour ice water on yourself and film it, or donate $100 to ALS research, then you challenge friends to do the same. The ice has turned into a social media snowball. It’s gaining tremendous traction – more than $15 million in donations to date, according to Time, and 1.2 million videos on Facebook and counting. Make it do-able: The Ice Bucket Challenge is not a major commitment of time or money. Some are criticizing this as slactivism. I call it plain old smart. Rely on the visual: The videos are tapping into something iconic, athletic, and celebratory. There’s a commonality to them and yet the differences are also grabbing. Celebrities have also gotten into the game. Let’s just say Bill Gates does it one way, Laird Hamilton does it another way. Give people an opportunity to look good: The Ice Bucket Challenge taps into our basic narcissism. Again, critics are citing this as an issue, but from my perspective, it’s an opportunity. Show off your hot bod, spacious yard, generous spirit, you-fill-in-the-blank. It’s a wet t-shirt contest, or it’s a postcard from your seventh grader to his friends. It’s whatever you want it to be. Make it inherently social: The pass-along element is critical to this effort’s success. It’s also another opportunity to look good and to define yourself in your circle (whether it’s your real circle, or your aspirational circle). It’s fascinating to see the connections. Bill Gates nominated Ryan Seacrest. Interesting. Ethel Kennedy threw down the gauntlet to President Barack Obama. That one captured some headlines. Embrace idiosyncrasy: The original idea of an ice bucket and ALS? Not so obvious. In fact, people who have the disease can’t regulate their own temperature, so the connection isn’t clear, nor is it perfect, but it doesn’t matter. Make it timely: Would you pour a bucket of ice water over your head in February? Didn’t think so. This is a summer stunt. Good thing it kicked off in July. Tell the human side of the story: The challenge has legs well beyond its original story, but one of the first to use the bucket of ice water as a platform for ALS awareness was former Boston College baseball player Pete Frates. (Earlier incarnations of the campaign were not connected to ALS). Frates, who was diagnosed with the disease in 2012, and fellow ALS patient Pat Quinn, began to challenge their social networks in late July. Last Thursday in Copley Square, Frates’ parents and 200 Bostonians gathered to douse themselves in support of the cause. First they made local news, then national headlines. The fast-moving disease has stolen their son’s ability to move his arms and legs. According to The New York Times, the former ballplayer married Julie, a woman he met eight months before he learned that he had ALS, and they’re expecting a baby next month. In a December video, Frates said: "The story right now goes: You’ve got ALS, have it for a little while, a long while, but either way, the end is always the same. ALS always wins. So in order to rewrite the end of it, we need to raise awareness, money." Thanks to Frates’ efforts with the #IceBucketChallenge, we’re well on our way. Victoria Grantham is MD of RoseComm. Find her on Twitter at @vgrantham.